by Peter Korn. David R. Godine, October 2013. 176 p. ill. ISBN 9781567925111 (cl. ), $24.95. 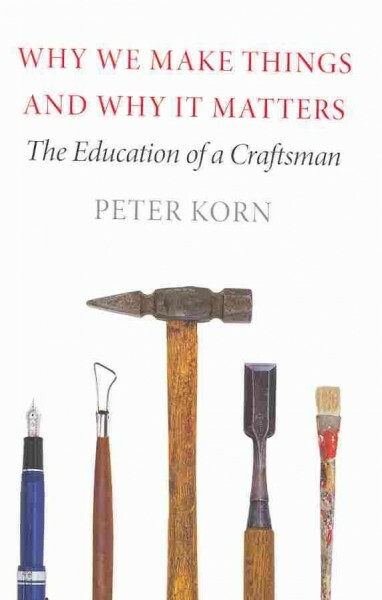 In his latest work, Peter Korn, furniture maker, author, and founder of the Center for Furniture Craftsmanship, reflects on the nature of work as it relates to craft and his efforts to design furniture and a life embodying “integrity, simplicity, and grace.” While his previous books were how-to manuals for woodworkers, Why We Make Things and Why It Matters departs significantly from that genre and is a memoir mixed with philosophical exploration and touches of craft history. Throughout this engaging and highly-readable text Korn cites authors who have explored themes of life, work, creativity, and craftsmanship. He begins his exploration with the ideas of Robert Pirsig, Richard Sennett, and Matthew Crawford. Korn diverges in the importance he assigns to creativity in engendering a sense of fulfillment and later extends this to other actions that bring something new into being whether it is baking, writing, or planning a school. Though nearly all of the fourteen chapters contain autobiographical content, Korn uses his own life as a point from which to segue into larger themes. The chapter “The Seductive Ideology of Craft,” examines the strong influence the Arts and Crafts Movement had on ideals held by makers of the author’s generation. In the chapter “Heart, Head, and Hand,” Korn examines the meaning that craft can hold for both maker and respondent and responds to some of Mihaly Csikszentmihalyi’s work related to creativity. Within the brief but intriguing chapter titled “The Creative Cycle” Korn deals with craft objects in the marketplace and the power of curatorial language on our understanding and assessment of such objects. What emerges from the varied chapters is an unaffected exploration of ideas the author formed over the last forty years about craft, the elements of a fulfilling life, and the personal struggles and successes experienced along the way. There is a section of thirty-three endnotes, a selected reading list, and an index. While the emphasis of this book is not visual, there are twenty-three small black-and-white images dispersed throughout the text and a section of sixteen glossy pages with color plates. It is printed on alkaline paper and has a high-quality sewn, rounded-back, case binding. This book is recommended for both public and academic libraries and will be of particular interest to readers involved with the crafts and others interested in a memoir about satisfying work, creativity, and the pursuit of quality.